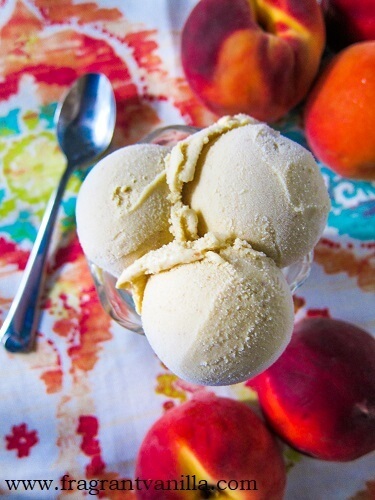 I have been really into the berries this Summer, but what I have really been craving lately are some peaches! They are not something that grows local here, but this is the time of the year when you can get the really good ones, so when I find some, I have to get them. A lot of the ones this year that I have seen have not been the most ripe, so I have refrained from buying them, but Eric and I finally made it over to a store that always has really good perfectly ripe ones, and I bought a whole bunch. Enough for a batch of wine, a pie and making some ice cream! The latter of which today's post is about. 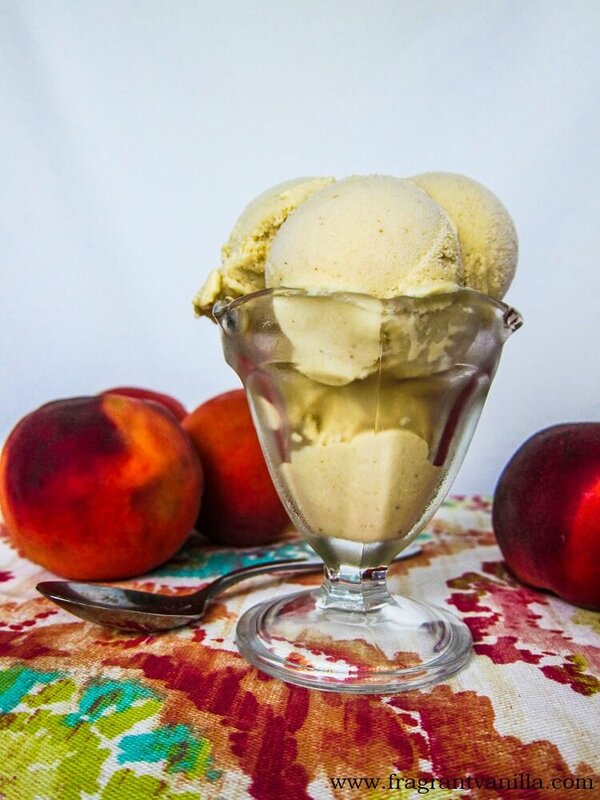 I decided that some peach ice cream sounded perfect so I had to make some. 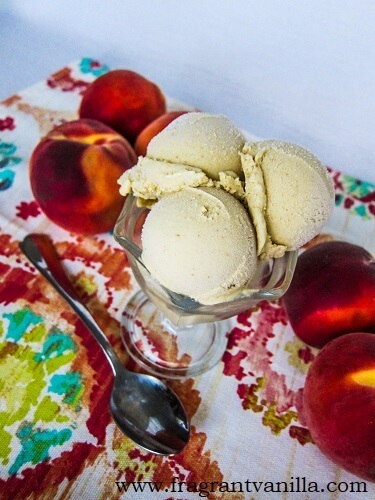 Growing up, my Grandparents often had peach frozen yogurt or ice cream in their freezer and it was pretty good! It wasn't something that we had at my house, we usually just had the ice cream flavors with chocolate, mint or strawberry. So it was something that was kind of a treat at my Grandparent's. They always let me have some too if I asked. I was thinking about that ice cream and how good it was while I was at work sweating it out in the kitchen, and I had all of the ingredients on hand at home! It was quite simple to make really, I used a coconut milk and cashew butter base to make it extra creamy, rich and delicious! No, this is not a low fat recipe. So no need for anyone to comment on that letting me know. I am fully aware that this is rich, and that is how I wanted it! Because ice cream is a treat. Man was the base ever dreamy too! It happens to be completely fruit sweetened, because the peaches were sweet, and I added dates as well to give it a slight caramel flavor. Also, I decided to give it a slight upgrade and add some bourbon, because why not?! 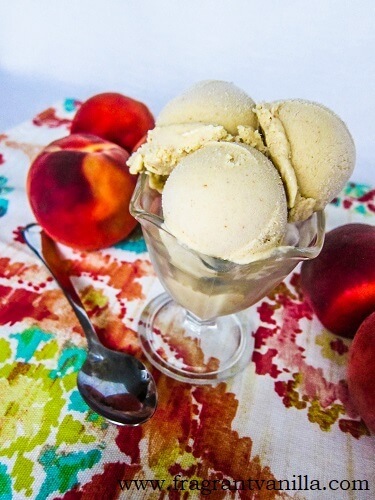 Not only does it give the ice cream a little bit of smooth delicious bourbon flavor, but it prevents it from freezing too hard so that it is more scoop-able. But you don't want to add too much or it will not set up, just enough to give it flavor. Once it was all frozen and ready to go, I couldn't wait to try it! 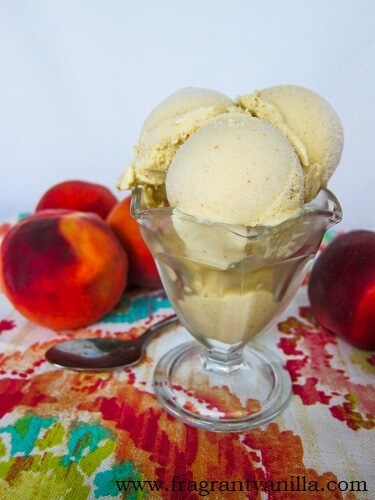 It was sweet, full of peach flavor, creamy, dreamy and delicious! This is something I would get a double or triple scoop of at an ice cream shop! You would never be able to tell that it is vegan either because it tastes even better than the dairy ice cream I ate growing up. If you have peaches on hand, give this s try! Pour into an ice cream maker and process according to directions. Alternatively, if you do not have an ice cream maker, pour it into a bowl, and whisk every half hour until it is to the consistency of a thick malt. Pour into a freezer safe container with a lid, and continue to freeze until firm enough to scoop (at least 4 hours or overnight). If it becomes too firm, simply let it sit out for 15 minutes before serving.